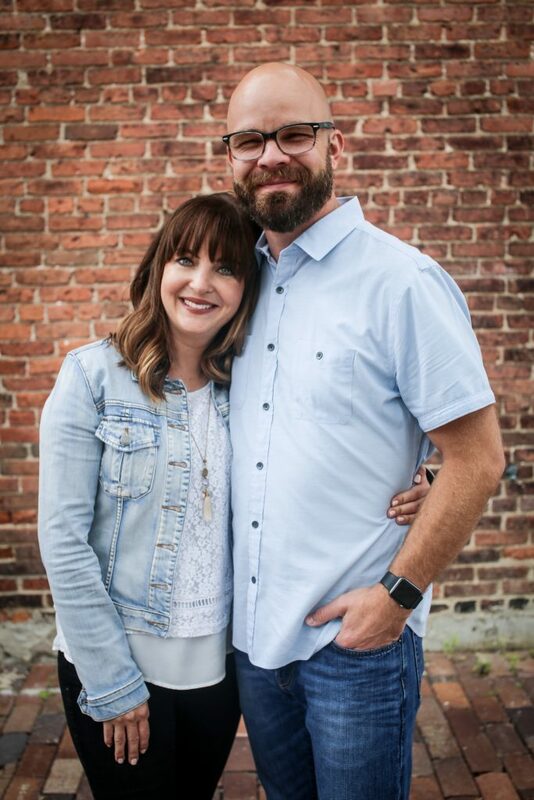 Do you ever struggle to stay connected with your spouse when life hits a busy season? I’m not talking a regular, consistent lifestyle of busyness – that’s an entirely different issue that may require an overhaul of schedules and priorities. I mean those months here and there where plates feel fuller than normal and, as a result, date nights seem scarce. My husband Ted and I hit one such season last summer. While we weren’t like two ships passing in the night, at times it definitely felt like we did an awful lot of passing and not so much pausing. We passed each other in the hallway, in the kitchen, and even in our master bedroom bathroom. There were many “Good mornings” and “See you laters,” but not nearly enough “How are yous?” At least not ones paired with actual time to stop and intently listen then and there. Between Ted’s growing responsibilities at work, me writing my first book, and us parenting four kids under the age of ten, finding time to sit down and delve deeply into each other’s daily experiences wasn’t happening. Our current schedules didn’t allow for a lot of quiet dinners of green curry and drunken noodles at our favorite Thai restaurant. It seemed that any attempt at having a conversation of depth was interrupted by a work-related emergency or a needy child. This left one of us quickly promising, but not always following through with a “We’ll talk later, okay?” But when later finally came, sometimes we couldn’t even remember what it was we’d wanted to discuss in the first place. This soon took a toll on our normally strong communication patterns. We hit a two-week period where misunderstandings and offenses left no room for clear communication and grace. One evening, we finally hashed it out. I won’t pretend it was pretty. It wasn’t. It reeked of more misunderstanding. More offense. And even angry words. In the end, we both agreed to abandon our pride and hurt feelings in exchange for humility and forgiveness. We also found ourselves determined not to let this seasonal busyness eat away at the unity of our marriage. Unity was too important. The problem was we knew it would be a couple months before our schedules would lighten. We needed a strategy in the meantime; a game plan to put into action while we waited for things to slow down. What did we do? We decided to be more intentional with the time we did have together. Maybe like us, you’ve hit a hectic season too. 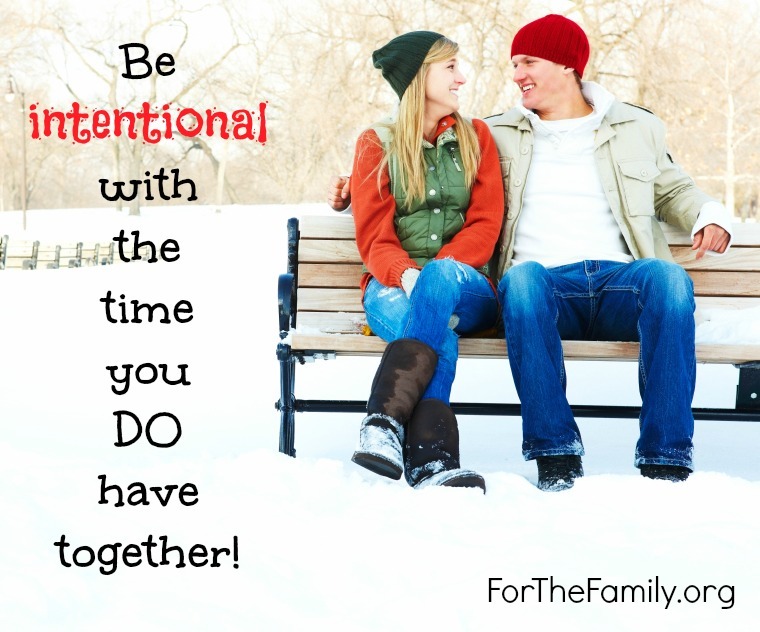 When marriage meets busy, how can you make the most of the time you do have together? It was tempting for us to use the hours after our kids were in bed to play catch up. You know, on things like house cleaning, emails, and the never-ending piles of work. While we often devoted a portion of our evening time to these tasks, we made sure to end the day with a couple hours together. We’d fill each other in on what we tackled individually, ask how the other was doing emotionally and spiritually, and normally take in a “bedtime story” in the form of a favorite TV show or classic movie. We ended our evening hours by going to bed at the same time. Together. This gave us time to continue to chat as we both drifted off to sleep or for physical intimacy. 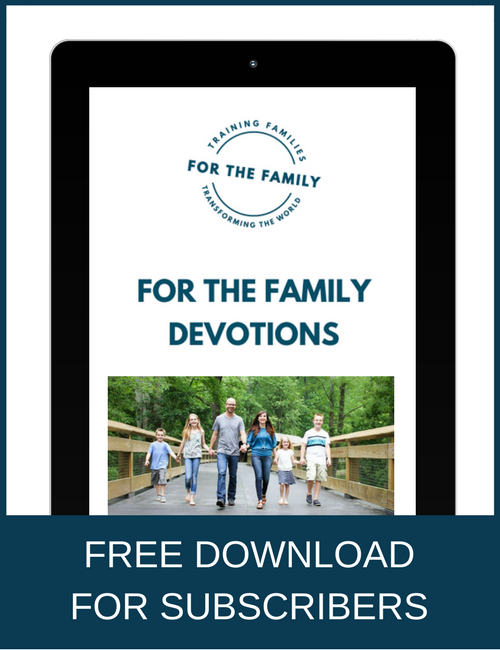 It was during these last hours of the day that we often tackled the issues that weighed heavier on our hearts – such as concerns about one of our kids or areas we felt discouraged and needed prayer. Living in the Atlanta area, we hit traffic everywhere we go. As a result, we spend a lot of time in the car. So when we’d pack our four kids into our mini-van to head to Costco or a local museum, we’d normally hit play on an audio book for them or bring along magazines or books to read. While they were entertained, we could talk uninterrupted – well, for the most part. A couple months later, my completed manuscript was in my editor’s inbox and Ted only had two urgent projects rather than five. We eagerly returned to our regular pausing, not passing, habits. We once again had more time to ask “How are you?” and then stop to intently listen then and there. And because we’d determined to stay connected even when our marriage met busy, our return to normal came easily. Great reminders, Ashleigh. The evening connecting has been key for us. This will be encouraging for a lot of couples. We work opposite hours so sadly we do not get the night time either! So we have to work really hard on the limited time we have which might be one day on the weekend but whenever you have time you have to grab it & not let the laundry & dishes get in the way! Thanks for sharing! Stacy,that’s great that you make it a point to find time together even though it’s tricky with your conflicting schedule. Thank you for this great article! We have three kids ages 3 and under, and a 9-year-old. My question is how do you find “hours” at night to spend together?! Our kids go to bed around 9(and sometimes later…oops) and then we have to tend to the coal stove, cleaning up, and getting things ready for the next day. We finally get to bed around 10 and are exhausted! I am really missing date nights(which happen far too infrequently) and need to connect with my husband. But there is always something more that needs to be done or needs our attention! How do you make that work? BTW, I stay home so I do as much work as I can during the day. And we rise and shine at 6 every morning. Hi Amy, great question! It sounds like you are in a trickier season with three kids under the age of three. We’ve hit a place where our youngest is almost three, which makes evening time more manageable. I remember clearly the days when ours were infants. That meant we normally had a little one with us for some of those evening hours between feedings and trying to establish good sleep patterns — especially in the newborn to 6 month stage. It can be hard from season to season. So for you, it may be that you have to figure out other times to make the most of rather than evenings. Maybe you could set aside some time in the morning since you are early risers? Or maybe after dinner you could encourage your 9-year-old to entertain the little ones so you can your husband can chat — even if it’s only for 15 minutes. As far as evening hours go for us, an earlier bedtime for our kids has always been a priority which has helped. On normal days, our kids are tucked into bed by 8:30 p.m. When they were younger, it was 7 p.m. Now that we do have older ones — almost 10 and 8 — that means sometimes we let them read in their beds for a little bit after we say goodnight. My husband and I are also night owls. We tend to stay up until around 11 p.m. because neither of us have to be up until at least 7 a.m. the next morning. I think that helps too. And honestly, sometimes I leave the dishes or the laundry until the next day. Anyway, since couples do vary because of ages of kids, work schedules, etc., I think the things I mention in this article can help inspire you to look at your own marriage and be creative in finding time. I hope you and your husband are able to come up with some ways that work well in the season you are in. This is just what I needed to see this morning.. Thank you!! It is extremely difficult to stay connected when one or both spouses work, raising kids and all the extracurricular activities that add up as well. Much less when a “season” comes along! As a woman, wife and mother of 3, I know my marriage HAS to be first but sometimes I NEED an extra reminder to keep me in check. Once you get in the habbit of not making “us time” it’s very hard to break. Definitely worth the extra effort to keep that from happening!! Thanks again!